Conkers, and Cider, The Hobby Horse and Story Orchard. 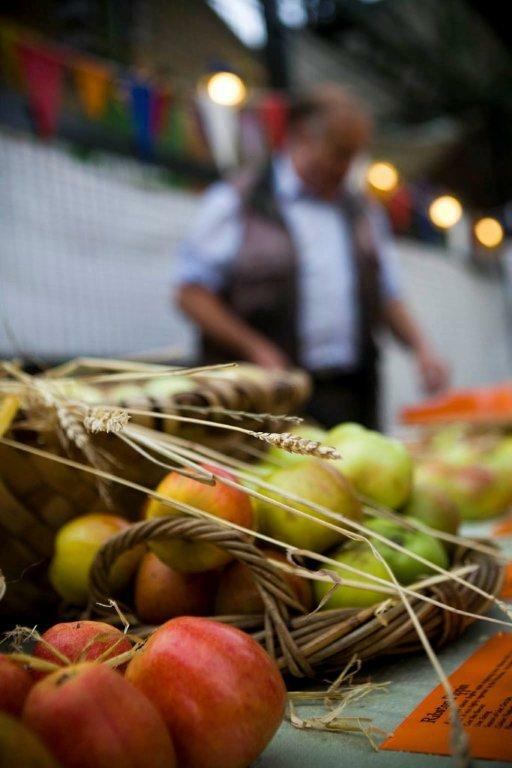 October Plenty is an Autumn harvest celebration held annually in Southwark. Beginning on the Bankside, by Shakespeare's Globe, October Plenty mixes ancient seasonal customs and theatre with contemporary festivity, joining with historic Borough Market, Southwark and Borough Market's Apple Day. We are raising money now for our next festival October Plenty in the Borough Market the fourth Sunday of October! Many of you sent questionnaires back to us after 12th Night and said that you would be willing to pay for our festivals if you could buy tickets. We do not sell tickets but you can donate. Click through to the Virgin Giving page here and make a donation. That way you will ensure a sustainable future for the Lions part. Just think of it as buying a ticket or buying a stake in the festival which will remain free at the point of contact. A huge Corn Queene effigy heavy with 'Plenty' - wheat, barley and other grains, and apples, root vegetables and foliage from the Borough Market - appears in a procession around the front of the Globe, Bankside, with the Company of actors and the time-honoured Hobby Horse in attendance, strung with cakes and loaves and led by the Berry Man. 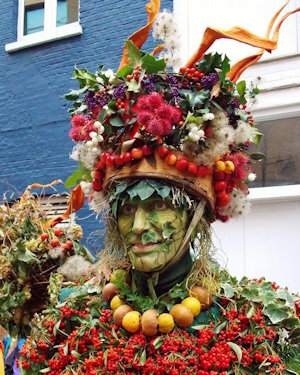 The Berry Man - our Autumn incarnation of the original Green Man - decked with wild fruits and foliage, leads the company. He carries an Apple Tree to where it will be placed within the Bankside area, with general songs and music on the street for all. After gathering the crowd from the Bankside, we move through the streets to the Borough Market to join in their Apple Day festivities. There is time to savour the delights on offer: soul cakes, apple biscuits, conker fights, cider from the New Forest, apple bobbing, a great beer selection and the wonderful market stalls as well as more Music and song. Always especially adapted for October Plenty and spiced with festive spirit and song, these plays are performed in Southwark where Chaucer's pilgrims first gathered - sit back with cider and pies and enjoy! 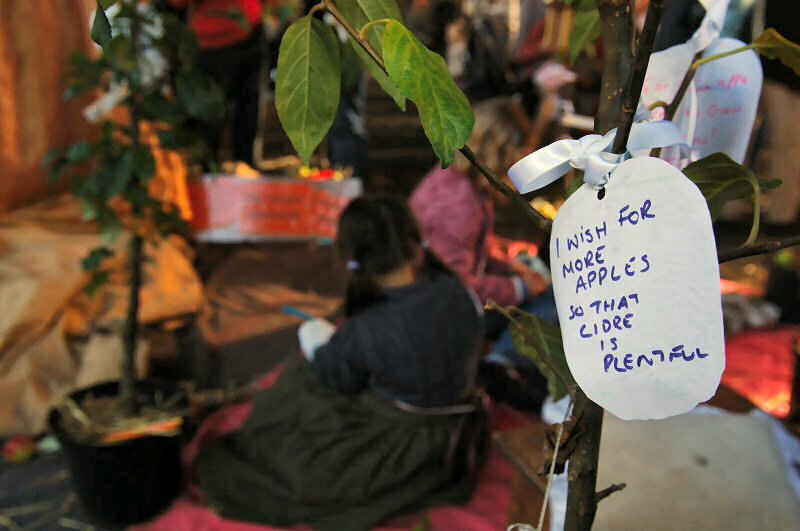 We create a little glade of young English apple trees as a space for children to gather. There they can decorate and re-clothe the trees with green wishes (paper apples) and listen to stories about apples, markets, harvest time, bees and many an autumnal tale! There is a tasting table of old apple types from London and the regions supplied by Brogdale Horticultural Trust and other private donors. Discover & explore the apples of old England before they all disappear! Tastes of the old, the rare, the local & the downright odd. Bring your own mystery apples & see if our Apple Doctor can identify them.